“HUC” is a tricky acronym, almost always used as an acronym and rarely spelled out. Every watershed (whether the Upper Mississippi Watershed, the Turkey River Watershed, or the Otter Creek Watershed) has been given a unique identification number by the United States Geological Survey (USGS). That number is called the Hydrologic Unit Code, or HUC. Bohemian Creek Watershed, by Spillville, has a Hydrologic Unit Code (HUC) of 070600040201. The Turkey River Watershed has a Hydrologic Unit Code (HUC) of 07060004. The land area of the watershed, determines the number of digits needed to represent that HUC number. Really big watersheds, like the Upper Mississippi River Watershed, need only 2 digits to identify it: (i.e., 07) (There are only 21 “HUC 2” or “2-digit HUCs” in the United States). The smallest type of watershed identified, Bohemian Creek Watershed, Otter Creek Watershed or Dry Mill Creek Watershed for example, uses 12 digits to identify it. (e.g., 070600040201) (There are something like 160,000 “HUC 12” a.k.a. “12-digit HUCs” in the United States). There are 53 of these “12-digit HUCs” a.k.a. “HUC 12” watersheds within the Turkey River Watershed. Their names and size are listed below. Why talk about HUC 12 watersheds? As part of our comprehensive watershed planning process, it has become apparent that it will be beneficial for us to start prioritizing sub-watersheds of the Turkey River Watershed for future watershed projects. 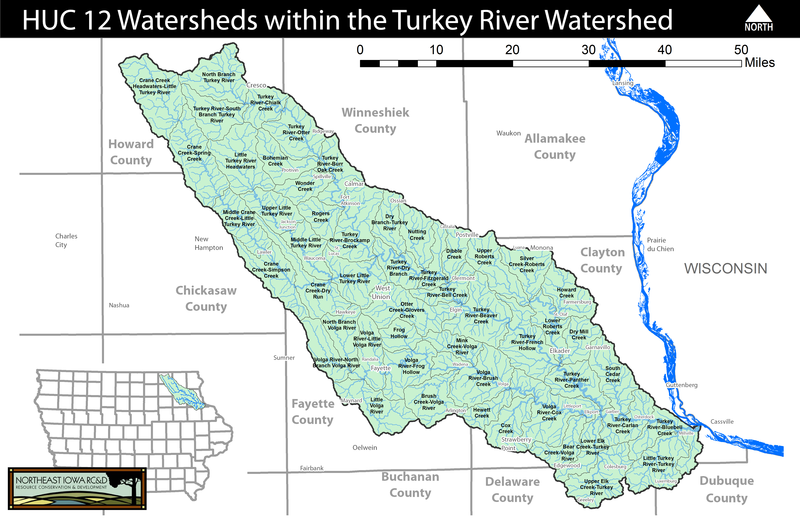 The United States Geological Survey (USGS) has conveniently divided the Turkey River Watershed into 53 smaller, sub-watersheds, each referred to as a “HUC 12” watershed. These smaller watersheds give us a chance to effectively focus our energy and resources to get the greatest return on our collective investment. Once we have a list of projects and a plan, we can go right down the list – implementing one HUC 12 watershed project after the other.